By Daniel Horowitz- Doing what Jews of every generation have always done – build for the future - a new and historic chapter in Jewish life north of Steeles Avenue – and across the Greater Toronto Area – was ushered in on Sunday, October 14th, as more than 400 onlookers - including politicians, other dignitaries, and donors - celebrated the official opening of UJA Federation of Greater Toronto’s Joseph & Wolf Lebovic Jewish Community Campus in York Region. A project of UJA Federation’s Tomorrow Campaign, the most challenging, ambitious capital venture ever undertaken by any Federation, the festive day marked the culmination of more than a decade of dreaming, planning, fundraising and building, that began with the purchase of the 50-acre parcel of land in February, 2000, discovered by Lou Greenbaum, a true pioneer in the life of the Tomorrow Campaign, known then as Jewish Toronto Tomorrow. Through Lou’s early efforts, and the uncommon leadership and vision displayed by Leo Goldhar, there was no stopping UJA Federation. “The previous generations understood the need to build for the future,” said Ted Sokolsky, President & CEO, UJA Federation of Greater Toronto. “It’s truly remarkable to see just how far our Jewish community has come in the last decade. 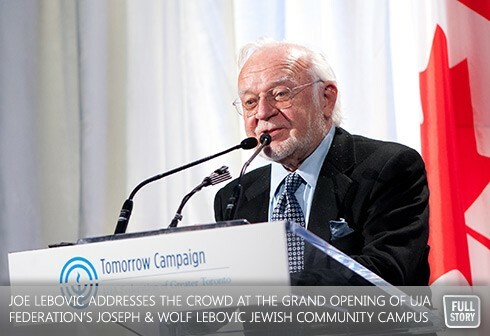 When the Tomorrow Campaign was launched - as Jewish Toronto Tomorrow – in 2000, at the Kiever Shul, nobody could have anticipated just how much our city’s infrastructure would change; improving lives of not only Jews, but the entire community, all of whom benefit from our new campuses downtown, midtown, and, of course, in Vaughan. The state-of-the-art Joseph and Wolf Lebovic Jewish Community Campus spreads over those 50 acres of land today – land that, in 2000, was nothing more than farmland, and is home to a network of agencies and facilities that rival anything in the world. With daycare, saltwater pools, an impressive workout facility, and much more, the Campus is open to not only the Jewish segment of the population, but the population at large. The keynote speaker at the October 14th event, Emceed by Global Television News Anchor Leslie Roberts, was a man who knows a thing or two about building impressive facilities that focus on customer satisfaction, Issy Sharpe, Mister Four Seasons himself. “This Campus was the vision of someone who said, ‘Look, we have a major Jewish community up here, and we should be doing things to further their education and further their wellbeing,’”, said Mr. Sharpe. “It’s the natural way of the Jewish community, coming together to meet the needs of others in the community.” And there is perhaps no better example in the world of how to meet the needs of a community than UJA Federation’s Joseph & Wolf Lebovic Jewish Community Campus. To see photos from the event, click here. To watch a video, click here.